I can see there’s going to be a lot of blue and white photos over the next few days. Santorini is picture-postcard perfect at every turn and almost all of it is blue and white. 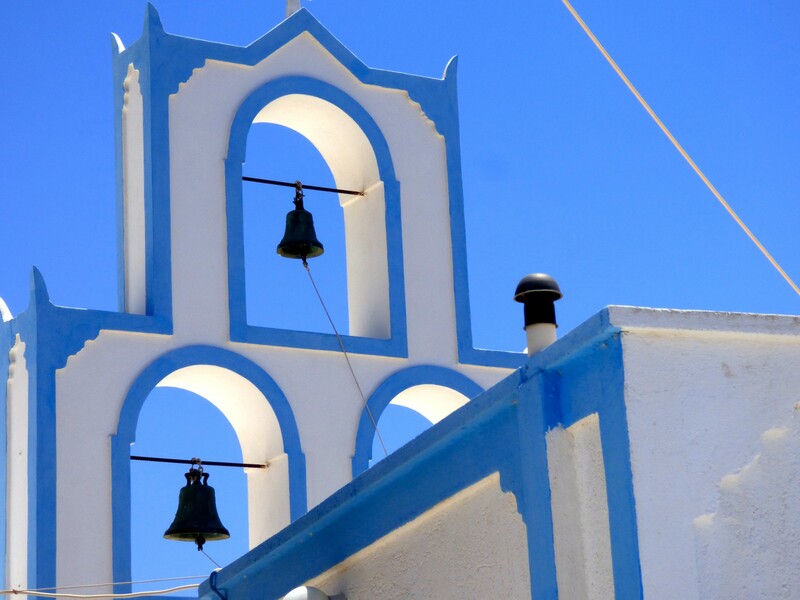 From the sky and sea through to the churches and houses, Santorini is the Greek flag come to life. We flew to Santorini on one of those flights where it takes longer to get your baggage than you actually spend on the plane. After a short drive we arrived at our house and were served a lovely greek salad on the terrace as a welcoming meal. The house is one of a small complex that sits on the clifftop at Megalochori and looks out over the caldera. Santorini was a major part of the Minoan civilisation until the volcano it was built on erupted about 4000 years ago. The result was a series of thin, curved and tall islands surrounding a deep blue bay. Even a short walk down the dirt track our house is on, took us past a couple of chapels complete with whitewashed walls, blue piping and little bell-towers; and all against the blue backdrop of sky and sea. We spent a very relaxing afternoon on the terrace, although it must be said the photos don’t show the ridiculously powerful wind-gusts, and took a stroll to the winery, that is the next building along, for coffee and ice-cream. For dinner we walked the cliff path down to Megalochori and had moussaka while the Sun set over the Aegean Sea. Some red to end the day. Looking out over the caldera. Sunset on the path back home.